Inspired by the most famous of Spiderman's enemies. Look fantastic with any fantasy costume. The name of these contact was inspired by one of the most famous Spiderman enemies - the Green Goblin. 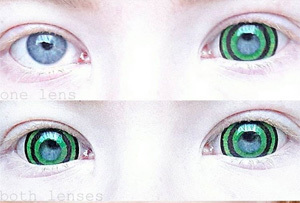 ColourVue mini sclera Green Goblin contact lenses feature a vivid green colour and a line that goes all the way around the iris, in the middle of the lens. Fine lines in the pigment create an illusion of three dimensions, which makes these contacts a very good costume accessory. Thanks to their large diameter, these lenses provide a very striking, noticeable effect on the eyes.